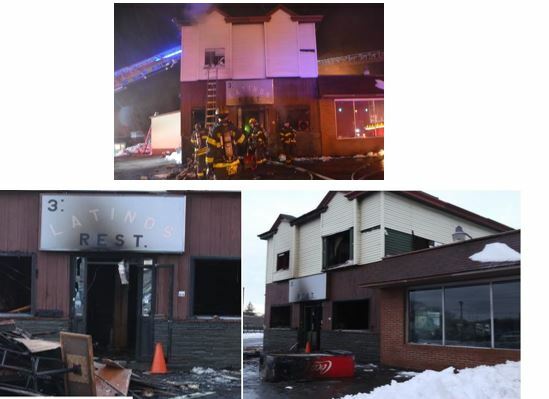 ROCHESTER – The Bureau of Alcohol, Tobacco, Firearms and Explosives (ATF) has offered a reward of $5,000 for information leading to the arrest and conviction of the person or persons responsible for the arson of the 3 Latinos Restaurant on 2 Palm Street in Rochester, New York. On the morning of March 5, 2018, at approximately 3:50 AM, witnesses reported a large amount of smoke and flames coming from the 3 Latinos Restaurant. It took firefighters approximately 45 minutes to control the fire, which was eventually contained. The restaurant sustained heavy fire damage. After further investigation by fire investigators, it was determined the fire was intentionally set and has since been labeled an arson. The fire started in the bar area of the one-story restaurant. ATF, along with the Rochester Police Department and Rochester Fire Department, Arson Task Force are committed to ensuring our communities are safe and that those who violate federal laws are held accountable. Anyone with information about this crime should contact ATF at 1-888-ATF-FIRE (888-283-3473). All calls will be kept confidential.